As promised: the following post is the first instalment in a series of my advice on a subject that is the centre of great discussion and even controversy. I’ll post regular instalments, each one offering a different activity or approach to making a living as a musician. The most important thing is to understand the music business as it is; not how you wish it were, or how it used to be, but how it really, actually is. My opinions are based on experience, both historical and current: as a snapshot of my current practice, I woke up this morning to 3 new online session requests, a client booking my re-amping service, and a session in my studio producing a song about the Royal Navy’s tradition of taking a tot of rum. Most young musicians’ vision of the music business is centred almost exclusively around being in a band, and from that springs all sorts of blinkered-ness and disappointment. The period of time in which a lot of bands could earn a living wage in this way was the shortest measurable blip on the timeline of music, but musicians persist in regarding it as the only “honourable” way to make music. That era died with the end of sales of recorded music as the prime source of income for musicians. 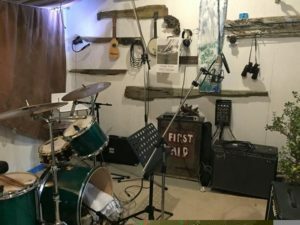 Get over it: accept that for the vast majority of you a band will only ever be a hobby… which is fine as long as you understand that, but don’t despair: follow my advice and you’ll find that you can earn a living as a musician. Here you are, in no particular order except for the first one, which is the most important of all. Royalty-based income is everything, even if you are only generating micro-royalties. Make it your business to get involved in activities that generate recurring royalty payments. It’s tempting to take the one-off payment, but if given the choice, take the royalty. You only have to do the work once, but it keeps on paying you for decades. Actively seek out such work: it’s usually based around writing. Be professional about it, learn about writing songs, instrumentals, lyrics… find your strengths and use them. Learn about performance royalties for musicians: join the PPL and register all the tracks you play on. Micro-royalties can come from streaming services, in store radio, even blogging about your work. They don’t look like much at first glance, but by the time you’ve got hundreds of tracks/blogs out there the money starts to reach meaningful levels and as you get older and money gets tighter that $300 dollars a year can make a big difference to your lifestyle. Set yourself up properly and register as a writer with the relevant collection society in your country. Use the data they supply to learn what works for you: which songs or instrumentals generate the most money? Use their legal and networking facilities, understand how the business side of the business works! If you play live gigs and perform your own material, register those gigs with the collection society. The PRS has a small clubs & pubs scheme: use it!